The following post is a part of the #BleedingLove photo series—a campaign which aims to break the stigma around periods in the South Asian community and around the world. We came together to raise awareness about the struggles women face in regards to menstrual health in the hopes of promoting menstrual equity and in turn, gender equality. Coke Studio Pakistan singer Momina Mustehsan talks about her love for music and her life. Now that Amy has participated in her sangeet night, had a traditional Indian and Christian ceremony, it was time to put her hair down and get ready for her reception party back at The Merion. Maharani Amy opted for a classic hair design that paired well with a softer, matte makeup look. Jasmin Rahmanreturned for her last duty as makeup artist and the bride was brimming with elegancy. Amy made a statement in a bold and sultry pink and silver ball gown designed from her very own fashion line, Naveda Couture. We still cannot get over this Maharani's talent! The sweetheart stage was a floral masterpiece and was kept clean and tidy with an archway of flowers perched above a white and gold chaise. Hats off to floral and decor masters, Elegant Affairs! Guests dined on dinner from Moghul while dancing the night away from beats by DJ BK Trehan. The Pinterest inspired gallery with all of the images from the multiple day event shot by House of Talent Studios awaits you! Maharani Amy had the most picturesque Indian wedding and now it was time for the Christian ceremony at the Grace Episcopal Church. If you missed the Indian wedding, click here! You don’t want to miss the details of the floral draped mandap handcrafted by Elegant Affairs! 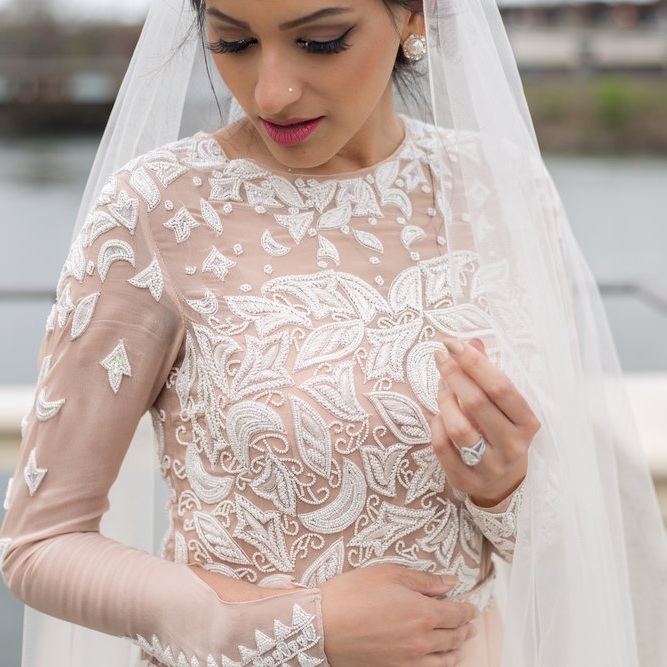 We have seen a lot of vintage wedding garb, but this gorgeous one of a kind piece designed by Naveda Couture has our jaws dropping! Amy’s dusty pink gown for her Christian ceremony was a custom design piece that was both elegant and modern incorporating hand-beaded ivory-micro pearls that was embedded throughout the garment. 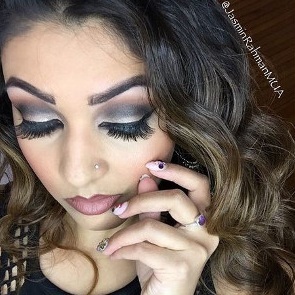 Jasmin Rahman was back for makeup duties and glammed the bride with a soft, elegant glow. Ben singing “God Bless the Broken Road” by Rascal Flatts while Amy walked down the aisle with her father was the most treasured memory of the day. Excuse me while I weep. It was at that exact moment that the bride and groom both basked in the glory of their union and realized just how lucky they were. Amy’s bridal party all donned different floral anarkalis that ranged from hues of orange and gold to pinks and whites, all handcrafted by the bride! I love this out of the box synchronization! House of Talent Studios always captures the most beautiful Indian weddings and the images are floating in the gallery for your pleasure! Just like the name of the city implies, this fusion Indian wedding was soft and sultry with hints of spicy piquancy! Naveda Couture designer Amy Devan became drunk in love after a chance encounter with her Maharaja Ben in a bar that sparked their love story. Interestingly enough, the couple had crossed paths at a wedding a few years prior to that fateful night! But, it didn’t take long for the pair to come to the same realization: They were meant to be. Even though Amy is a hard lady to surprise, Ben still managed to manifest a shocking proposal. Surrounded by their closest family and friends, he tucked away a precious wedding ring for his future to find in a box at the Escape the Room Philly; forever sealing the couple’s fate. 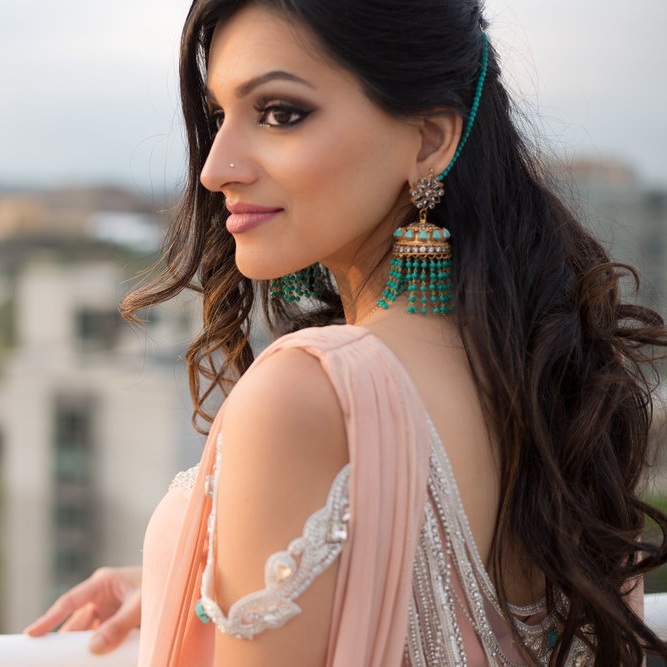 Maharani Amy had a trifecta celebration that started with a colorful sangeet night at the Pinecrest Country Club captured on film by Nathaniel Dodson. Amy’s wedding day started off with the preparation of the bride. 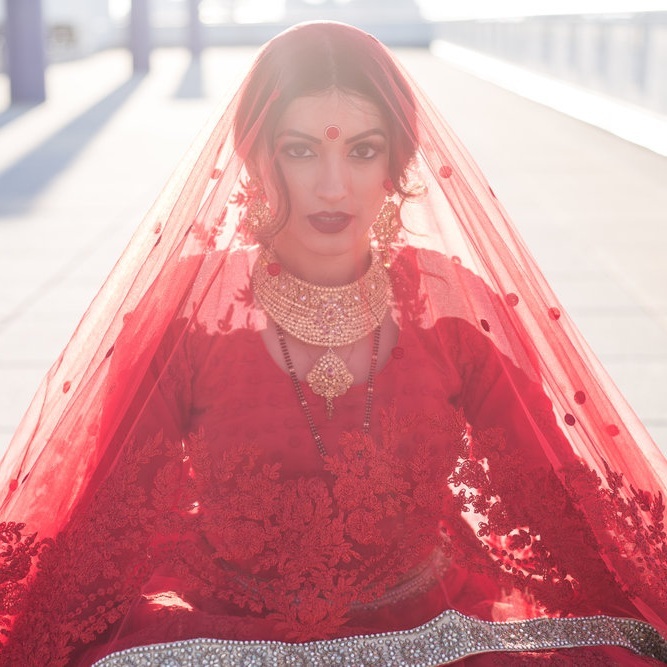 Jasmin Rahman created a stunning bride with glowing skin and bold, crimson lips that was an excellent complimenting look to the bride's red, lacy bridal lengha. Amy’s wedding attire was a nod to her own mother as this Maharani wanted to recreate the way her mother looked on her wedding day; classic and traditional. Planning a wedding itself is a daunting task, but, volunteering as tribute as a designer for every event (sangeet, mehndi, batna, both the Hindu and Christian ceremonies, and reception) is most certainly a victory here at Maharani Weddings! Amy owns her very own fashion line and designed all of her wedding attire alongside hand crafting her bridesmaid’s bridal wear from her fashion boutique, Naveda. Bridal jewelry from Samreen Vance was on point; the bold statement of the oversized gold choker did not miss a beat! The Hindu ceremony was held at The Merion with a floral mandap designed by Elegant Affairs that was breathtaking. We love when we get a wedding affair designed by this stellar floral and decor company; we have yet to see a mandap we don’t love! The theme of the night reflected a romantic setup on the veins of an enchanted secret garden. After the ceremony, guests dined on delectable cuisine from Moghul. Head into the gallery for a superabundance amount of images captured on camera by House of Talent Studios who also filmed the wedding and reception event. Want to know the deets yourself? Head down below for the full lowdown (in detail!) from the designer bride herself! Jasmin’s very own brain child, Bare Face Play challenges the notion that an editorial must involve size 00 models, with airbrushed makeup and features. 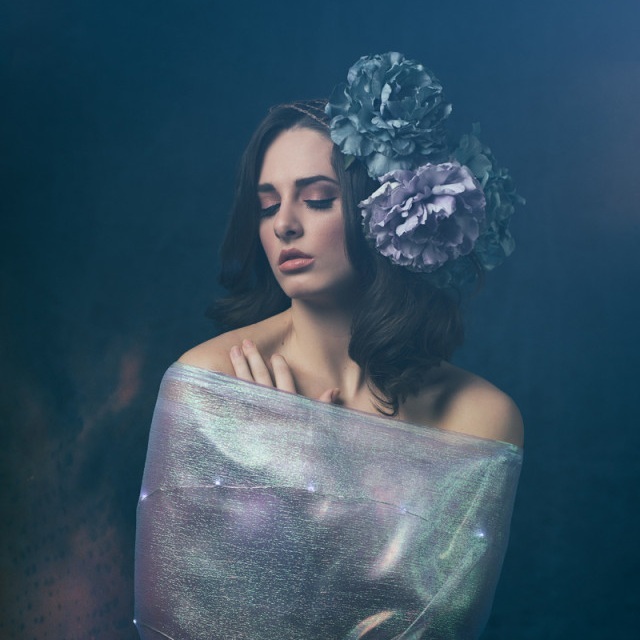 Jasmin's first venture into creative direction was the complete opposite of editorial beauty, but a photo journalistic approach at channeling each womans inner beauty and challenging them to face their insecurities in front of a camera! This love story has been shared across Philadelphia’s most reputable publications! Enchanted forest, fairy inspired photoshoot. Jasmin Rahman is modern makeup artist, go-getter and beauty blogger with South Asian women’s empowerment Website Brown Girl Magazine. As a bridal and editorial makeup artist, she specializes in clean makeup application for all skin types. Take a look at her Instagram profile for glam-tastic photos of her work and favorite beauty picks. Interview style feature in Brown Girl Magazine circa 2014, right before I became a contributor and eventually In-House Makeup Artist!